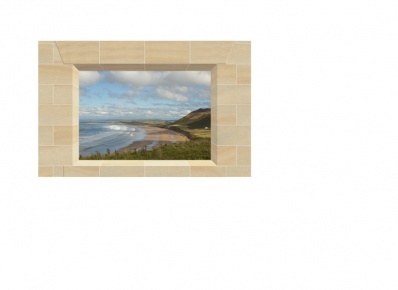 This mural is ready to 'order and print' - or you may customise it. This Window Opening mural includes a photographic scene from our own Collection, and it is ready to print. However, you may choose to customise it with an alternative scene. Please view the How To Customise Tab to see how you may personalise your mural. This mural is 235cm wide and at 150cm high it is intended for installation above the dado or handrail on walls less than 280cm high. It comprises 2 'drops' of wallpaper and if necessary you may trim it to fit your wall space perfectly. View the Details Tab for more information. 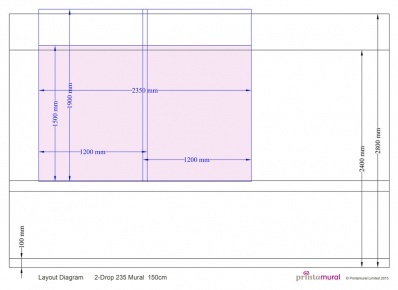 View the Layout Diagram image on the product page to find details about the different wallpaper materials that we have available. You may customise this Decorative Mural to create a truly unique mural for your care home. If you want to customise, or are just considering it, please Save the mural to your Basket and then call us on 02183 712171 to discuss your requirements. Or send us an email outlining what you want and we will contact you. You may choose a different ‘scene’ within your mural. This may be an alternative scene illustrated in any other Scenic Mural product, or a ‘scene’ of your own. This may be a photo chosen from an on-line photo library or a photo of your own. You may choose to include, remove or replace railings in your mural, using any of the styles illustrated within our Scenic Mural products. You may choose to include, remove or replace flora in your mural, using any of the types illustrated within our Scenic Mural products. Flora elements may be located to the left or right side of the mural - to suit yourself.